In this Monday, Aug. 20, 2018, file photo, police stand guard after the Confederate statue known as Silent Sam was toppled by protesters on campus at the University of North Carolina in Chapel Hill, N.C.
Crews removed remnants of a Confederate statue from North Carolina's flagship public university early Tuesday, hours after the school's outgoing chancellor ordered that the empty pedestal be put into storage because of safety concerns. The University of North Carolina sent a statement around 1 a.m. Tuesday confirming that removal of the pedestal was under way at its Chapel Hill campus. In a statement Monday, Chancellor Carol Folt had announced the plan to remove the empty base for the statue known as "Silent Sam" from a main quad. She also said she was stepping down at the end of the school year. 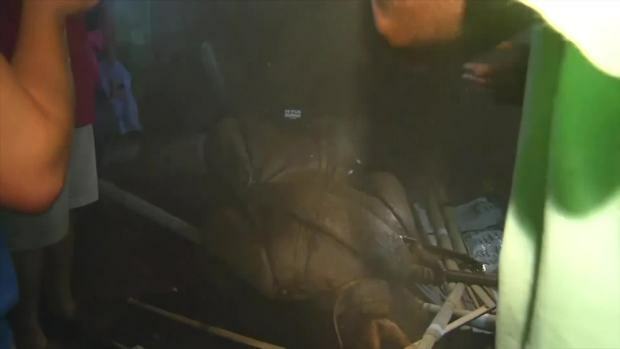 WRAL-TV reported that crews with a large truck, a forklift and floodlights took away the last piece of the base by 2:40 a.m., leading to cheers by a crowd that had gathered to watch. The statue itself has been in storage since it was toppled last August by protesters who say it was a racist symbol. Folt said the massive pedestal and bronze memorial plaques will also go into storage while their fate is decided. She cited concern for safety in her decision, saying: "The presence of the remaining parts of the monument on campus poses a continuing threat both to the personal safety and well-being of our community and to our ability to provide a stable, productive educational environment." Folt's surprise order drew an angry response from Harry Smith, chairman of the Board of Governors that oversees the state's public universities. The board had given itself until mid-March to come up with a plan for the statue, and Smith said that timeline hasn't changed. "We are incredibly disappointed at this intentional action," he said in a statement before the removal work began. "It lacks transparency and it undermines and insults the Board's goal to operate with class and dignity." As the public face of the university, Folt had been criticized both by those who wanted the statue gone for good, and those who said state law required it to be restored to where it had stood in McCorkle Place since 1913. The announcement of her departure comes weeks after the rejection of a plan, which Folt helped craft, to build a new $5 million history center on campus to house Silent Sam. Folt's announcement also comes shortly after the departure of the president of the statewide university system, Margaret Spellings, who had also frequently drawn protesters' barbs. The Board of Governors rejected that plan in December and announced it would go "back to the drawing board." Folt acknowledged in December that the plan to build the history center "didn't satisfy anyone." Folt, who came to UNC in 2013 from Dartmouth College, said Monday she was proud of work she'd overseen on the Campaign for Carolina fundraising drive that raised more than $2 billion as of last summer, or about half of its ambitious goal. But Folt's tenure also saw UNC sued by a transgender employee over the state's so-called bathroom bill, as well as the Silent Sam debate growing more heated after a deadly white nationalist rally in Virginia in 2017. 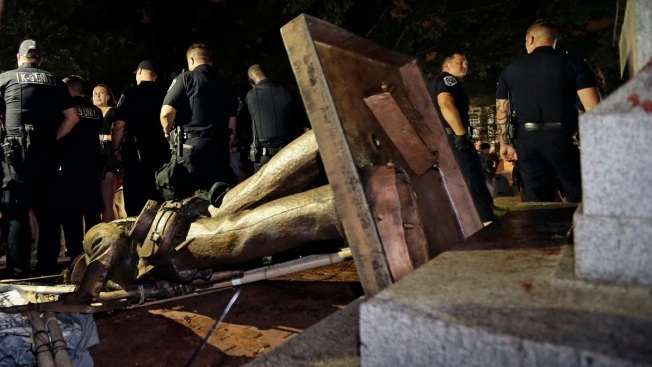 "Silent Sam" was toppled in August by protesters who decried its origins, including a racist speech by a former Confederate when it was dedicated. The Sons of Confederate Veterans issued a statement early Tuesday saying that Folt "has effectively erased the contribution and sacrifice of these brave veterans and the tribute paid to them by subsequent generations." Late Monday, before the removal began, the group's North Carolina spokesman Frank Powell said the group could use the 2015 law to sue if the removal went forward. Associated Press writers Gary D. Robertson, Allen G. Breed and Tom Foreman Jr. contributed to this report.